This paper was written by Graham Stone and Caren Milloy and published as part of Open Access Week 2018. It can also be downloaded as a PDF document. This paper outlines the current UK landscape for arts, humanities and social science (AHSS) monograph publishing, the state of business models to support open access (OA), the technical infrastructure, the engagement of the academic community and suggestions for improvement. Publishing a monograph is deemed as ‘important’ or ‘very important’ to 95% of arts and humanities researchers (Collins & Milloy, 2016). 8,513 books were submitted to Panel D in REF2014 across a long tail of 1,180 publishers (Tanner, 2016) representing the diversity of the AHSS research. 30% of 8,513 books submitted were published by the top 4 UK monograph publishers – OUP, Routledge, Palgrave and CUP (Tanner, 2016). Of the titles submitted to Panel D, 23% were published in 2013, but the publication date ranged from 2008 to 2013 (Tanner, 2016). Diversity also exists in the strength of feeling researchers have towards open access for monographs and its composite application with 48% viewing the principles of open access as positive but only 8% viewing the implementation as easy (Collins & Milloy, 2016). Research England (formally HEFCE) has stated that monographs must be published OA for inclusion in the REF2027 (Hill, 2018). Based on the REF2014 submissions, where publication dates for books submitted ranged from 2008 to 2013 (Tanner, 2016), titles submitted for the REF2027 will likely be being researched now for publication in 2021 or later. This presents a relative urgency for a functional, interoperable and transparent OA market to be developed that supports the long tail and is flexible enough to suit the diversity of AHSS research and its funding streams. In a drive to support informed decision making the UUK OA monographs group is conducting a research study to provide quantitative and qualitative data on the financial, technical and cultural issues that surround the UK’s transition to OA monographs. The current uptake of OA as a publishing option, whilst increasing, tends to be restricted to those that are OA advocates, are established in their careers, and is not widespread due to a number of ‘thorny’ issues that need to be tackled. (Crossick, 2015, p.4). The number of OA publishing options is also increasing, but predominantly under models that require a book processing charge (BPC) to be paid and whilst funding is currently available for such charges via the Wellcome Trust or funder research grant, the majority of AHSS research is not funded under a grant (Fyfe, et al., 2017). Innovative and experimental models, such as Knowledge Unlatched and Open Book Publishers, that do not require a BPC, struggle in a marketplace that is set up to sell to libraries. Evidence on the performance of OA titles and their impact on the sales of print versions is limited and hampered by a lack of standards and infrastructure. The 2017 Knowledge Exchange report (Fewerda et al., 2017), placed the UK behind other European countries owing to the small number of OA titles that are discoverable via the Directory of Open Access Books (DOAB) – with around half the number of titles compared to Germany and France. In 2016, the collective output of the top 4 UK based monograph publishers was 6,650 titles but it is not yet known what percentage of these that were published in OA as only 94 were listed in the DOAB. The UK therefore has some significant work ahead of it if AHSS authors are going to want to and be able to publish OA, if readers (including students) are able to discover and use OA titles, and if stakeholders including publishers, funders and institutions, are going to have the metrics required to monitor the development of an open and transparent publishing marketplace. 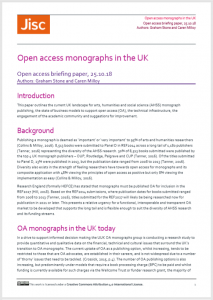 The UUK OA monographs group was established in 2016 and reports to the UUK Open Access Coordination Group (OACG). It comprises stakeholders including HEFCE, ARMA, funders, libraries, academics, learned societies, new and established presses and Jisc. The remit of the group is to promote and accelerate cultural change towards OA publishing within academia and among traditional publishers; advise on technical barriers to OA publishing and make recommendations for further work and investment; and promote innovation and diversity in business and publishing models for OA book publishing. The group discussed the evidence and issues presented in the previous mentioned reports and submitted an OA monographs funding paper and accompanying synergy paper to OACG, which was approved in March 2018. Two pieces of research will be undertaken in 2018. Data analysis to understand the financial landscape will analyse library budgets to understand funding allocations for monographs; budgets used to buy the titles submitted to the REF; the adoption of OA titles and presence in library discovery systems; licensing agreements for titles; and report on the availability and distributions of monographs submitted to the 2014 REF, alongside sales and usage data. The research will provide case studies and user stories to capture author attitudes (building on OAPEN-UK) and recommendations and best practice that address improving efficiencies for libraries budgets, stakeholder dialogue and funder policies. The research is being carried out by Fullstopp. A separate project is engaging in Dialogue with the sector. This project has hosted two events targeted at learned societies in association with the Arts and Humanities Alliance (AHA) and publishers in association with the Publishers Association (PA). Both events will be written up and will be submitted as evidence alongside the quantitative data from Fullstopp. If authors are to publish OA monographs we need ‘multiple models and combined revenue streams’ (Eve. at al) in addition to the book processing charge (BPC) route. Policies need to reflect this to avoid the development of an opaque OA market place that is dominated by the four largest commercial publishers (who are already well prepared to implement a BPC model, see table 1 below) and to give the long tail of publishers in Panel D and new entrants in the form of New University Presses (NUPs) and Academic Led Presses (ALPs) the opportunity to experiment with alternative models in order to compete and provide authors with choice. A system reliant on BPCs, without significant input of funding, is unlikely to be unsustainable as funding is not widely available in AHSS (Bargheer et al., 2017) and the library budget, which will in the medium term still need to support spend on print and electronic monographs due to academic preferences, cannot afford to cover BPCs. As an example of the range of BPC costs, a recent Ithaka study (Maron et al., 2016) found that the cost of publishing a single book ranged between US$15,140 (£11,700) and US$129,909 (£100,600). Based on the BPC listed in table 1, the cost of publishing all the titles submitted to the REF2014 published by CUP, Palgrave and Routledge (3 of the top 4) would be £180,490,000. However, Eve et al, 2017 pegged the BPC at £7,500 giving a cost of £63,847,500 for Panel D outputs. Table 1. Market rates for book processing charges. Adapted from Eve et al. (2017), Ferwerda et al. (2017) and publisher websites. Seven different types of business models are presented in the Knowledge Exchange report (Ferwerda et al., 2017); BPC (CUP, OUP, Routledge etc. ), crowdfunding (Knowledge Unlatched), memberships (OBP), mixed models (OBP), embedded institutional support (University of Huddersfield Press – NUP), and institutional funding (UCL press – NUP). Jisc has agreements in place with Knowledge Unlatched (KU), OBP, Ubiquity Press and de Gruyter and is currently in discussion with Peter Lang who had 112 titles submitted to the REF2014. The uptake of these, which tend to be membership agreements remains low. For example, participation in KU has dropped from 77 in round 1 to 19 in round 4. 24 institutions participate in the OBP membership, 0 in de Gruyter and 2 in Ubiquity Press (although many NUPs use Ubiquity press as a publishing platform). Institutions express difficulty in committing funding to support new models in light of constrained funding. This makes it difficult to foster a dynamic publishing ecology and it is hard to see how new market entrants will be able to become embedded if there is not an appetite to commit funds or funding available. It is expected that the UUK research will shed further light on this challenge. Jisc is also investigating aspects of this in a survey of libraries regarding OA publishing services in conjunction with colleagues at SCONUL. This will report in February 2019. However, the Jisc changing publishing ecologies report (Adema & Stone, 2017) showed that there were 19 New University Presses in the UK in 2017. By 2018, this figure has risen to 21, and it may be as high as 30 by 2020/21. There are also at least 18 Academic-led presses either based in the UK or publishing for the UK market. Both types of operations expressed the need for a better developed infrastructure to allow them to compete with established presses on a level playing field. Jisc is expediting the entry of ALP, NUPs and other OA presses into marketplace by providing advice and guidance on the requirements of libraries and offering ‘light weight’ agreements. It is also fostering a community building process through a series of workshops and a toolkit, as recommended in the report. Little research has been conducted on a green route which is currently restricted to a single chapter or 10% of a title, with long embargo periods (CUP – 6months, OUP, 24months, Palgrave – 36months). Academics are vocal at expressing concerns around the quality of pre-publication versions, re-use and derivatives and publishers the impact on print sales but as yet, little evidence has been gathered and only one NUP, Goldsmiths, is applying a green route. Although similarities exist, the book market and its underlying infrastructure is quite different from journals. A worldwide infrastructure that supports both traditional and new modes of discovery, acquisition, access and use of OA monographs is essential, as is the need for standards in a range of areas such as sales, usage, downloads, BPC rates, embargo periods, licensing attributes, digital object identifiers and metadata. Regarding metadata, a major barrier highlighted by NUP/ALPs is the difficulty for OA monograph publishers to enter the library supply chain to achieve greater visibility and discovery of OA monographs. Both the library supply chain and booksellers such as Waterstones, Amazon etc. are not set up to offer monographs that are free at the point of use and this is hampering discovery and embedding. In addition, metadata can be inconsistent and varies in quality (Neylon et al., 2018) and the availability of books in catalogues varies by publisher. The OPERAS-D project is focused on the development of a European research infrastructure for open scholarly communication. The HIRMEOS project is developing a layer of added services (identifiers, entity recognition, certification in the Directory of OA Books (DOAB), open annotation, usage metrics) on top of existing platforms to increase discoverability and visibility. Jisc is implementing a dynamic purchasing system to offer NUPs, ALPs and Gold OA publishers a transparent, secure and procurement compliant route to contract with the suppliers of publishing services to enhance the availability and dissemination of scholarly content and a sustainable research infrastructure. Jisc has engaged with OPERAS to maximise compliance and standards adoption. Jisc held a workshop in July 2018 with key stakeholders from NUPs, ALPs, book suppliers, bibliographic service providers and libraries to discuss the hypothesis that OA publishers have difficulty accessing the channels that library acquisition departments use to buy print and e-book content. The outputs from the workshop will be published in a blog post shortly to encourage open peer review, reaction and comment to identify next steps to support OA monograph discoverability and availability. As findings from these initiatives develop, it is important that the UK considers what developments are required at a national or local level (such as repositories), how these link into the wider global infrastructure and how essential components of an OA monograph infrastructure, DOAB for example, will be supported financially by the UK. There have been many consultations and in-depth studies completed on the underlying attitudes of authors to open access publishing (Milloy & Collins, 2014; Frass, Cross & Gardner, 2013, 2014; HEFCE, 2016). In addition, evidence gathered as part of the various House of Lords and House of Commons investigations into open access also convey the complex issues and strength of feeling. Reactions to Hill’s keynote at the 2018 University Press Redux conference and subsequent article in the Bookseller (Hill, 2018) have shown that OA monographs remain a highly emotive issue in the academic (and publishing) community. OAPEN-UK (Collins & Milloy, 2016) identified that many researchers (including early career researchers) identify more strongly with their discipline (and learned society) than their institution. Continual dialogue with academics and their learned societies is essential to the development of any future policies to avoid academics viewing OA monograph publishing as an administrative and unfair burden. The UUK research will provide an up to date benchmark of academic perceptions building on the research carried on researcher attitudes towards OA as part of the OAPEN-UK study. Dialogue is central to the successful implementation of any movement towards OA. Issues need to be discussed within a framework of what is important to each stakeholder. Solutions should then be developed collaboratively across all stakeholders. This should apply not just within the UK, but internationally, including the alignment of policies across funders to bring consistency. The Knowledge Exchange will hold a workshop investigating some of these issues with funders from a number of European countries in November 2018. Policies set out maximum costs for BPCs?